Three of our Presidents, including George Washington, U.S. Grant, and Dwight Eisenhower, served as our chief military commander before entering the Oval Office. How do their careers compare? What kind of Presidents were they? If measured solely on his battlefield performance, Washington was the least successful general of the three. The most important victories of the Revolutionary War occurred at Saratoga, which brought the French into the war, and Yorktown, which ended it. Washington was absent at Saratoga, and he could not have won Yorktown without essential military support from the French. Washington’s military career began at the onset of the French and Indian War in 1754. His first mission, which involved monitoring construction of a fort near Pittsburgh, ended with surrender to the French. A subsequent expedition, led by British General Braddock, ended in disaster. But Washington got credit for his bravery in battle and for organizing the retreat. The young officer gained valuable military experience despite serving in losing battles. During the Revolutionary War, Washington won daring victories at Trenton and Princeton. But he also lost key battles on Long Island and New York, allowing the British to capture New York City. He then lost at Brandywine and Germantown, resulting in British control of Philadelphia. Monmouth, the last battle in the north, was a draw. Afterward, the war moved to the South, where the Americans were led by other generals. While Washington may not have been the most successful general in battle, he kept the army and country together throughout the war. He outlasted five British generals and successfully coordinated efforts with different governors, states, and militias. He also worked, not always successfully, with the Continental Congress to provide funding and supplies for the army while preventing the politicians from interfering. No doubt these skills served him well when he became President! As our nation’s first President, he dealt with many issues including financing the government, dealing with France and Britain while avoiding war, establishing the role of the federal government and, voluntarily leaving office and establishing the two-term limit and peaceful transfer of power. U.S. Grant attended West Point and fought in the Mexican War. After the war, he conducted a variety of assignments and eventually ended up in California. Separated from his family, and becoming lonely and depressed, Grant left the Army. When the Civil War broke out, he rejoined the military and led the Army to several victories in the West, including the capture of Vicksburg. After having secured Union control of the Mississippi, Grant earned Lincoln’s promotion to command of all the Union armies, a position in which he went on to defeat the Confederates in Virginia and obtain General Lee’s surrender at Appomattox. Grant easily won election as President in 1868 and re-election in 1872. Some consider Grant a failure as President, due to the many scandals that occurred during his term. But he also strongly supported African American rights during his Presidency and sent Federal troops into the Southern states to enforce those rights and suppress the Ku Klux Klan. Grant also appointed both Jews and African Americans to Federal offices; he created the first Civil Service Commission, and the first National Park (Yellowstone). 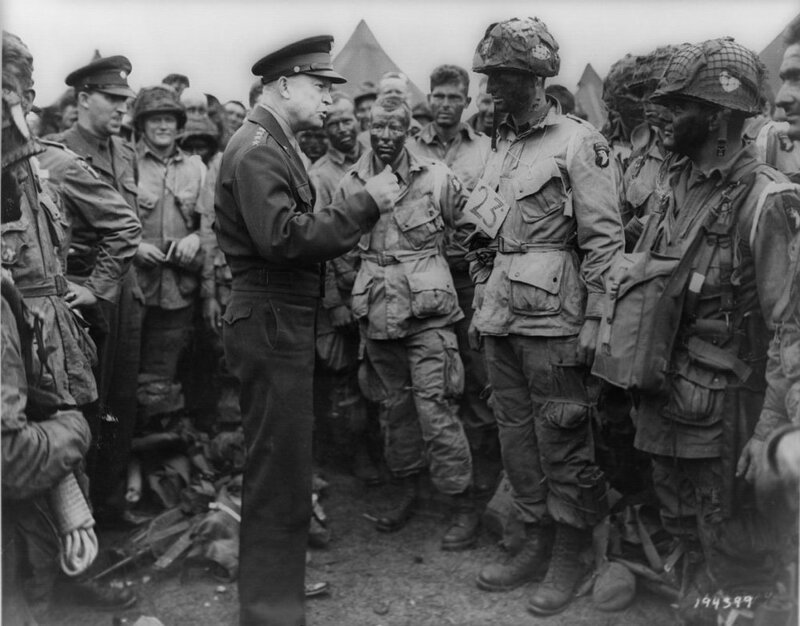 Eisenhower was never in direct combat – either as a leader or soldier. He graduated from West Point just as World War I ended. After the war, he served all over the world including stints under Generals Pershing, MacArthur, and Marshall. Eisenhower’s overall organizational and planning skills led to his promotion to Supreme Allied Commander in Europe. As Commander, he had to negotiate between multiple allies and politicians with conflicting points-of-view and strong egos including FDR, Churchill, De Gaulle, British General Montgomery, and U.S. General Patton. Like Washington, this experience also helped him as President. Ike won an election in 1952 and re-election in 1956. While in office he ended the war in Korea, avoided escalation in the Cold War, created the Interstate Highway system, and started the space program. Congress passed two civil rights bills during his administration, the first to be adopted since Grant’s Presidency. In 1957, Ike sent the 101st airborne to restore order in Little Rock after riots ensued over enrolling blacks in a previously all-white school. This was the first use of Federal troops to enforce civil rights also since the Grant administration. These efforts eventually led to the Civil Rights and Voting rights acts of the 1960’s. How are these leaders similar? Where do they differ? Washington and Eisenhower both had strong political components to their military roles, having to deal with multiple different parties to reach agreement on strategy and plans. This skill is certainly useful in the political arena and translated well into their administrations. All three desired peace. Those who have fought in a war, with its destruction and death, are hesitant to enter another. As Presidents, Washington and Eisenhower were successful in keeping America out of war – Washington kept the country neutral during the rivalry between Great Britain and France; Eisenhower kept the Cold War from getting hot; Grant worked on peaceful unification of the North and South after the Civil War. In fact, Grant’s Presidential campaign slogan was ‘Let us have peace’. In his memoir, completed just days before his death, he expresses hope for peace between the divided North and South, stating “I feel that we are on the eve of a new era, when there is to be great harmony between the Federal and Confederate… The universally kind feeling expressed for me at a time when it was supposed that each day would prove my last, seemed to me the beginning of the answer to Let us have peace”. Eisenhower, shortly after World War II ended, stated, "I hate war as only a soldier who has lived it can…” In his ‘Chance for Peace’ speech, he said, "Every gun that is made… every rocket fired signifies, … a theft from those who hunger and are not fed, those who are cold and are not clothed.” And in Eisenhower’s famous farewell address, he warned against the potential power of the ‘military industrial complex’, the result of high and ongoing defense expenditures. Washington felt the best way to avoid war was to avoid foreign entanglements, as expressed in his farewell address – “It is our true policy to steer clear of permanent alliances with any portion of the foreign world”. Washington and Eisenhower are considered among our best Presidents. Grant’s poor reputation is gradually improving. But there is one aspect of Washington that stands out. By voluntarily stepping down both as Commander of the Army and later as President, he established the principle of peaceful transition of power. King George III of Britain was reputed to have said, referring to Washington voluntarily giving up power, “If he does that, he will be the greatest man in the world”. A painting of this moment hangs in the Capitol Rotunda.